The important functions of your mail.com Organizer. Helpful tips for using the Organizer and managing your appointments. The mail.com Organizer helps you to plan and manage your appointments. You can import appointments to mail.com from other applications or synchronize the mail.com Organizer with calendar applications. You can also invite other e-mail contacts to your appointments. Click on the mail.com Organizer to add new appointments or edit existing appointments. You can use different calendar views to better manage your appointments. (1) Navigation bar: Takes you to other mail.com products. (2) Add new appointment: Use this button to add a new appointment. (3) Date navigator: The date navigator helps you to view a certain day or week in the calendar view. (4) Calendar list: The calendar list shows you your default calendar ("My Calendar") and any other calendars you created yourself. (5) Organizer settings: In the organizer settings, you can adjust your mail.com Organizer, change the appointment settings, import or export a calendar, or delete calendars/appointments. 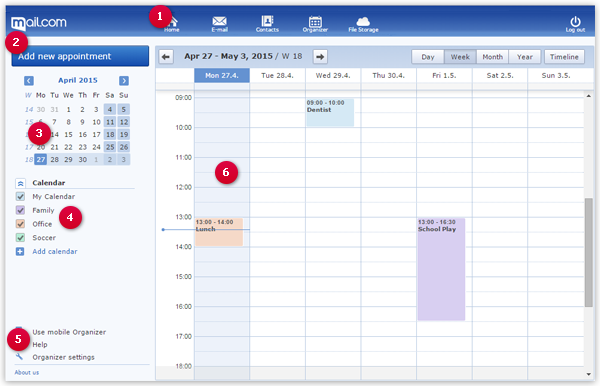 (6) Calendar view: The calendar view shows your appointments. You can choose between viewing a day, a week, a month, a year or an appointment timeline for a three-month period.